In this chapter, our trio - Zhang "Follows look" Bora, Kwon "Follows taste" Eun-Taek and Hong "Just follows" Sul - seem to be guilty of the same train of thoughts towards Yoo "Follows Hong" Jung. It is as if, for some reason, everyone was expecting Jung to be leagues above a normal human being. Like never cheat. Or never be wrong. Or not be a psychopath. I think it's sometimes possible to expect too much out of somebody, and that's ain't roight. OMFUCKING G THANK YOU GUYS SOOOOOOO MUCH!!! Just build me a coffin a throw me in already. That was great. I love you guys. I can agree with you Doonge. These last few chapters with Young Gon. I don't know, I kinda feel sad for him. *not really* he just can't get away with anything. Thanks for this chapter too! This chapter was great ! I'm looking forward to read the next chapter ! KYAA~ thanks a million, seriously! Thank you for the fast translation! I don't really like the way Jung handles things. It feels as if he used Hong's friend to do the dirty work. I wouldn't be too happy with him even though he tried to help. I'm sorry but I really cant view CITT latest eps... cant even translate it into English. Anyone please help? 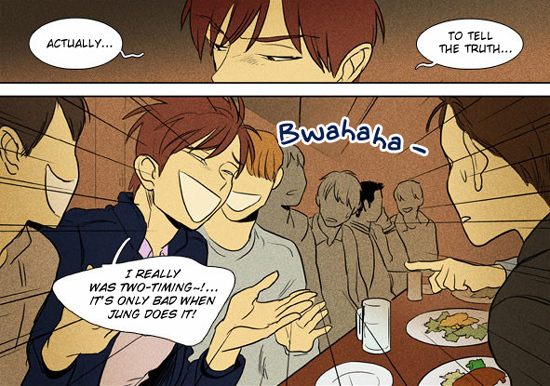 its not like Jung isn't awful too ( or worst), he just doesn't get caught.